Your ticket to heartwarming hospitality, amazing scenery and scrumptious food, our Gift Vouchers make the ultimate present! 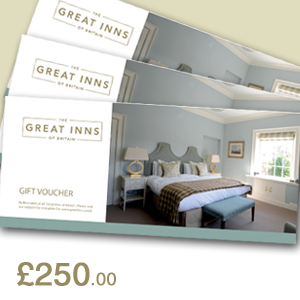 The Great Inns of Britain Gift Vouchers are the perfect solution when you want to give someone special an equally special treat. Available for any amount upwards of £50, the vouchers are valid for 24 months and are presented in a stylish folder. Vouchers are valid for use against a stay at any of the Inns that are current members of Great Inns of Britain at the time of making a booking. To purchase your gift voucher, please select from the options below or alternatively you can call us on 01423 770152. We will endeavour to dispatch your voucher to you within seven days. If you need the voucher urgently, do call us and we will do our best to help, or alternatively you can choose to print the voucher at home! Please note that we will endeavour to send the gift vouchers as soon as possible, however, there may be a delay with the postal service when ordering during busy seasons. In need of a Gift Voucher in a hurry? There’s no need to panic as you can now purchase Gift Vouchers online and print at home yourself in seconds. We will email your voucher as soon as you place your order so all you need to do is print and then present to that special someone! Please note: there is a £2.00 handling/postage fee per order – this will be added to your order at checkout.